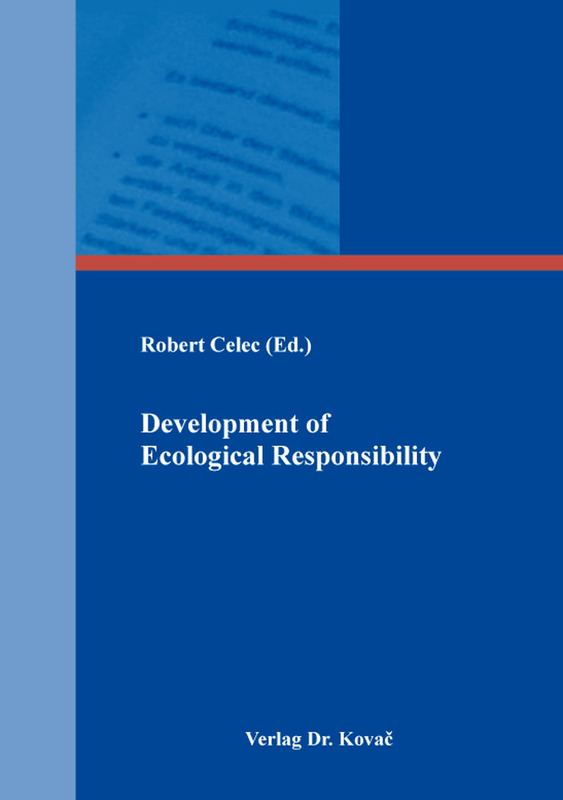 Development of Ecological Responsibility. Sammelband von Robert Celec (Ed. ), Verlag Dr. Kovač 2017, 362 S.
Sustainable development is defined as development that satisfies the needs of the present without compromising the ability of future generations to satisfy theirs. The book starts from the aim of sustainable development which is to define viable schemes combining the economic, social, and environmental aspects of human activity. These three areas must therefore be taken into consideration by communities, companies, and individuals. Chapters are based on a premise that there are many initiatives in favor of sustainable development. These initiatives, which are rarely part of a long-term plan, are conducted by a wide variety of players, analyzed in the book: private and public-sector companies, associations, NGOs, territorial authorities, educational institutions, healthcare facilities, public bodies, etc. All these initiatives sometimes constitute a local knowledge base that must be exploited, promoted, and shared. Findings to what extent the topic of air pollution is included in the curriculum for the first two triads of primary education in Slovenia and how to prepare the corresponding didactic material to meet some of the environmental education objectives at the lower primary school level in relation to air pollution (acid rain), including through the use of a practical experiment to help students better understand the topic. Findings that ecological diseases are indeed a serious topic for discussion, particularly if we keep in mind the fact that millions of people have some of the symptoms of ecological diseases. Ecological diseases include the computer vision syndrome, SBS (sick building syndrome) and the multiple chemical sensitivity syndrome (MCS). Despite the share of renewable energy sources in primary energy balance of Slovenia is high, many unused potentials in the field of exploitation of renewable energy sources still exist. Particularly, high potentials have been found for the utilization of solar energy. Aapplication possibility of cost benefit analysis in food production projects as the decision support tool for further planning process. In the educational context the garden has always had ups and downs throughout history and the different concepts of usage in schools were, according to the motivations of investment and use always very diverse. The importance of drinking on the health benefits of children: children are not drinking enough in the mornings and the need for drinking is (too) often meet with drinking sugary and / or fizzy drinks. The phenomenon of physical activity and its influence on various aspects of man’s life have in the recent research been often associated with cultural and ecological conditions. Respect for the ecological model ensures increasingly more comprehensive framework for understanding of the influence physical activity has on health and life of people, as well as possibilities of intervention.